A giant man, Tonga'uiha's power and turn-of-pace make him a dangerous weapon in the loose. He made his Test debut for the composite Pacific Islanders side in 2004 and began to make a name for himself in 2005-06 when with Bedford Blues in National One. 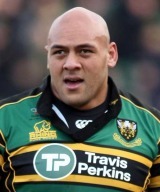 After moving to Northampton Saints he again excelled in England's second tier and helped his new club to promotion. Having made his debut for Tonga in 2005 he was selected for the 2007 World Cup and played a big role in their eventful group campaign. He then played a prominent part in the Saints' Guinness Premiership and Heineken Cup exploits in 2009-10. In January 2010 it was announced that he would be joining Saracens, although he later turned his back on the move and signed a new deal with Saints, greatly angering his prospective employers. And after shining throughout the 2010-11 Premiership season, Tonga'uiha earned a call-up to the 2011 Tongan World Cup squad.